100 transparent sleeves. 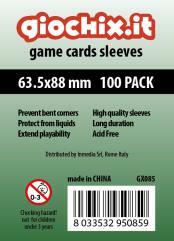 All card sleeves are Acid Free, Archival Safe, and guaranteed to fit your cards nice and snug! Our card sleeves will extend the life of your cards so that you can enjoy your favorite games for years to come without having to worry about greasy fingers, worn, tattered cards, or liquid damage.